Snow-capped mountains, lush tropical forest, crystal clear water and an active volcano. They call it The Big Island for a reason! The Pooch Mobile dog wash expanded into the Hawaii market in 2016 offering mobile dog washing services on The Big Island of Hawaii. 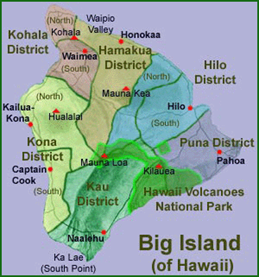 The Big Island is the largest of Hawaii’s main islands with a total area of 4028 square miles. Hawaii is the newest of the 50 states of the United States. Hawaii is located in the Pacific Ocean to the southwest of the Continental U.S. It is made up of over 100 islands; however there are eight main islands that make up the Hawaiian Islands and only 7 are inhabited. The island of Hawaii is the third largest island in Polynesia, behind the two main islands of New Zealand. Simply use the zip code locator to search for The Pooch Mobile operator for your area or complete a booking request for your dog and a Pooch Mobile operator will contact you to arrange an appointment.